to its original look with this high quality replacement housing Faceplate Cover. Buy this High Quality cell phone housing faceplate cover for replacement at great wholesale prices with no minimum order quantity! 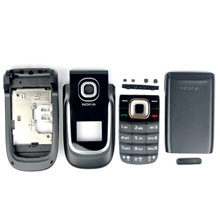 Brand New High Quality Complete Set Housing Faceplate Cover for Nokia 2760 (Black). Precision molded cases to perfectly fit your Nokia 2760. Complete Set Housing Faceplate Cover for Nokia 2760 (Black) is molds perfectly to Nokia 2760 shape and highlight its beauty. Complete with replacement Keypad and Small Parts.